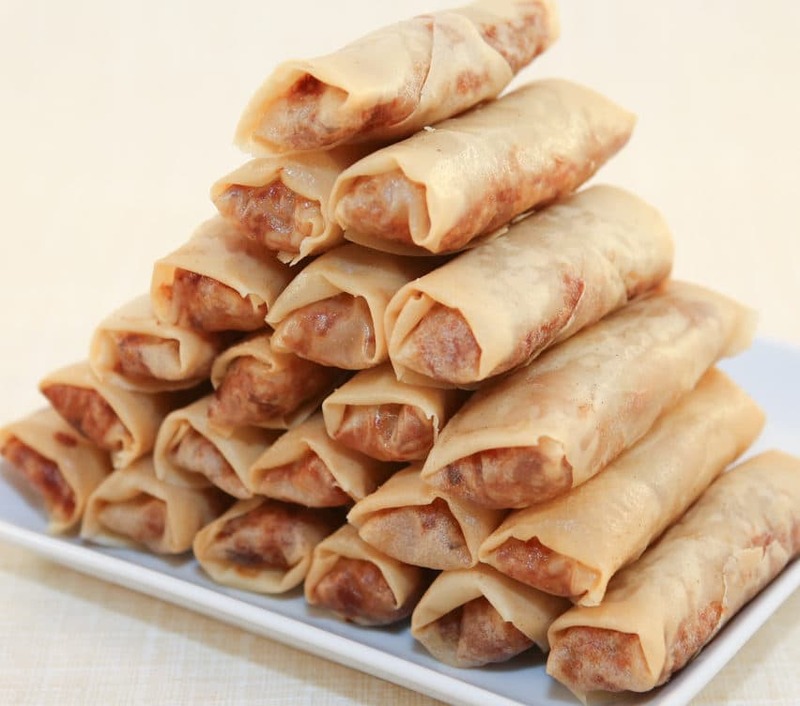 This is my Mom’s Egg Rolls (Cha Gio/Nem Ran) recipe and I have to say, these egg rolls are the best I’ve tasted. (Thanks Mom!) I like the balance of meat–pork and shrimp, and vegetables in the filling. This recipe uses carrots which is quite common. 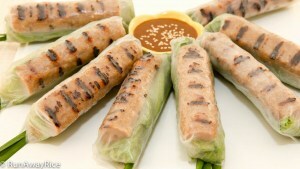 The taro root is a differentiating ingredient and adds a nice mealy texture to the egg rolls. There’s no cabbage in this recipe which I find makes the filling wet and gives the egg rolls that funny (you know!) smell. Give this recipe a try. It’s sure to become your favorite! Peel off a small stack, about 5-7 egg roll wrappers at a time. Fold in half to form two triangles and then using scissors, cut along the folded line. I cut the entire package first. When rolling, I take one of the small stacks, peel off the individual wrappers and then make the egg rolls. To keep the unrolled wrappers moist, cover with a damp paper towel. When I am short on time, I make the filling the night before and then refrigerate. The next day, I roll and fry. Any leftover egg rolls can be refrigerated and then reheated in a toaster oven. They’re just as delicious as freshly fried! Strive to have the same amount of filling in each egg roll. Also prior to rolling, evenly distribute the filling forming a small log on the wrapper. This way you will have an even amount of meat and wrapper and everything will cook at the same time. Don’t let the egg rolls sit too long before frying. The wrapper will get moist from the filling. Make sure to use enough oil to completely immerse the egg rolls when deep frying. If you use too little oil, the egg rolls will not brown evenly. I find the egg rolls cook faster when deep frying in a single layer. Double stacking or over-filing the fryer increases the cooking time. I love the taste of peanut oil! The egg rolls brown up really nicely and quickly with this oil. If you don’t have an electric fryer, deep fry the egg rolls in a saucepan or wok. Use a thermometer to get the right temperature. Peel the skins off the carrots and taro root and rinse with water. Pat thoroughly dry with a paper towel. If using frozen taro root, cut into smaller chunks. 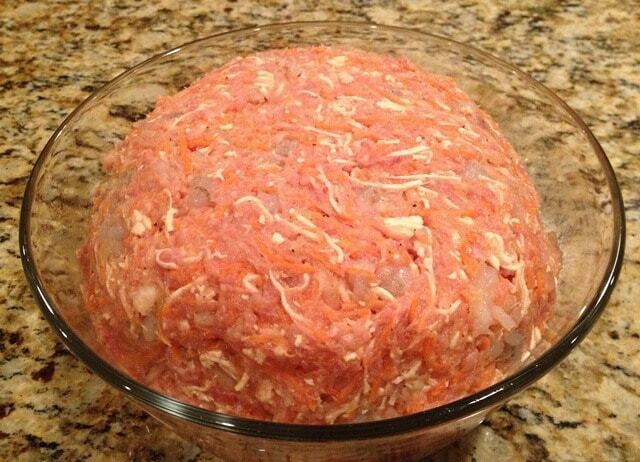 Use a stand mixer with a shredder attachment to finely shred the carrots and taro root. Alternatively, use a food processor or mandoline to achieve the fine shreds. Finely dice the onions. Mince the shrimp by hand or use a meat grinder attached to the stand mixer. If using pork pieces, grind the pork using the meat attachment as well. Soak the bean thread noodles in warm water for 10 minutes to soften. Blot the noodles dry using a paper towel. Using scissors, cut the noodles into short strands. In a small bowl, combine the 1 Tbsp cornstarch and 1 Tbsp water and stir until smooth. We will use this mixture later to seal the wrapper. See above for tips on cutting and peeling the egg roll wrappers. Place a single wrapper triangle on a cutting board so the point is on top and the longest side of the triangle is closest to you. Place 1 heaping tablespoon filling on the wrapper centering it along the bottom edge of the wrapper. Fold the left and right sides of the wrapper over the filling. (The two folded sides should meet in the middle of the roll.) Take the bottom edge and fold it over and then roll gently away from you. Use firm pressure but don’t roll too tightly or the wrapper will tear. When there’s just a 1/2 inch triangle section of wrapper left, dip a finger in the cornstarch/water mixture and dab the top triangle with the “glue”. Finish rolling, sealing the wrapper edge well. Roll a batch of a dozen egg rolls and fry as directed below. Heat the oil to 375 F (191 C) in an electric fryer or saucepan. Place the egg rolls into a fryer basket with the seam side down. Put the basket in the oil so that the egg rolls are just partially in the oil. Hold the basket in place for 10 seconds. (This seals the edges of the egg roll.) Now release the basket into the oil completely. Deep fry for 10-12 minutes or until the egg rolls are golden brown. If you like them crispier, fry for 13-15 minutes. Remove the egg rolls from fryer and place on paper towels to absorb the excess oil. 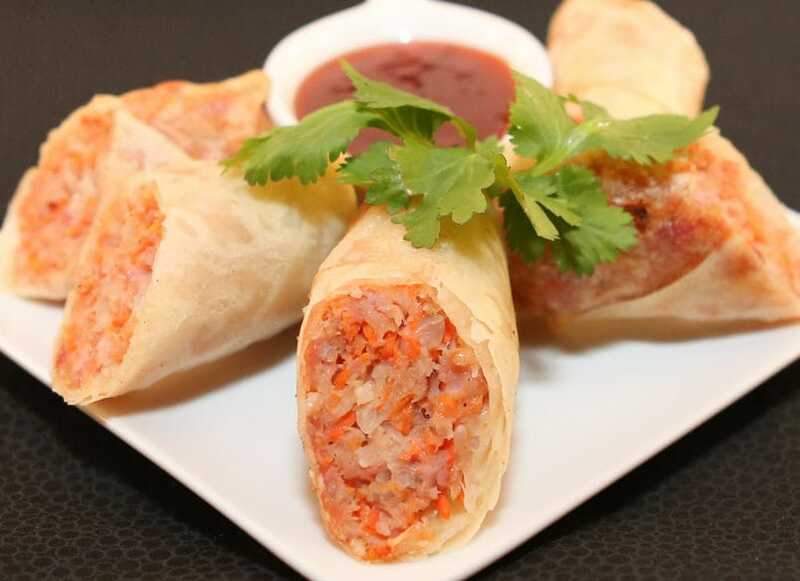 Serve with the Egg Rolls with your favorite dipping sauce. 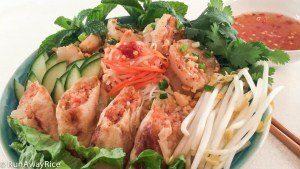 Optionally make an Egg Roll Noodle Bowl with rice noodles, fish sauce dipping sauce, and fresh greens and herbs. We use wood ear instead of taro root. I definitely want to try your version. Do you have a video for making this? I know I can do it from memory but I’ve never tried on my own yet.